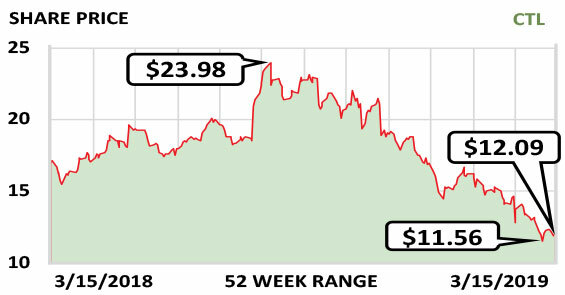 CenturyLink Inc. (CTL) is still seen by most investors as an old landline company whose phone customers are going away quickly. That perception is misguided. Since buying Level 3 in November 2017, CenturyLink has become a technology company focused on enterprise and business customers rather than consumers. About 75% of the firm’s revenue is now from the business-and-enterprise sector—and through Level 3, CenturyLink has one of the best fiber-optic networks for delivery of telecommunications services. The old landline business is actually declining only a few percent a year, not quickly—so revenue is only dropping slowly. And profits are rising steadily as CenturyLink goes through its refocus and turnaround. The company took on high debt, $35 billion, for the Level 3 acquisition, and recently cut its dividend to put more cash toward debt paydown. But even the reduced dividend, which is $1/share/yr., recently yielded 8.27% and appears quite sustainable. Revenue was $23.4 billion last year and is likely to be $22.8 billion this year and $22.4 billion in 2020. Fiscal year: December. Earnings per share: 2020 est./$1.30…2019 est./$1.20…2018/$0.98.